A section of the main Dublin to Belfast railway line has collapsed in Malahide in north Dublin. It happened this evening north of Malahide station on the viaduct across the estuary. Iarnród Éireann has said the collapse had the potential to be a serious tragedy. 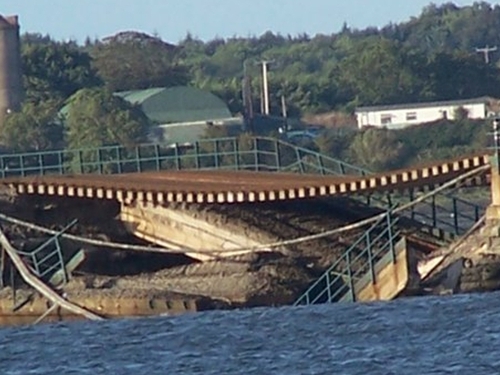 A 20 metre section of viaduct on the Broadmeadow estuary, between Malahide and Donabate gave way at around 6.20pm. The damaged line was noticed by the driver of the 6.07pm train travelling from Balbriggan to Pearse station. He drove to Malahide station and reported what he had seen. All other trains were immediately stopped from using the line. There were 40 to 50 people on the train, but no one was injured. Iarnród Éireann says it will be investigating the incident fully. The company says lines are inspected regularly and viaducts have a maintenance regime. There will be shuttle bus services between Drogheda and Skerries for northern commuter services. However, transfers are being arranged between Dublin and Drogheda for Dublin/Belfast services.